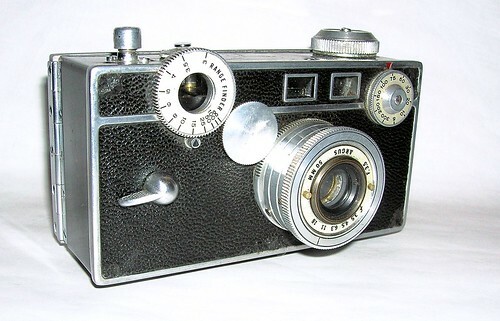 The Argus C-2 was a popular, durable camera made from 1938-1942 by Argus, Inc. of Ann Arbor, Michigan & Chicago, Illinois (USA). It improved on the Argus C by adding rangefinder coupling, via a simple idler gear between the lens focus ring and the rangefinder dial. Along with the C and C3 these cameras are sometimes dubbed "the brick." The C2 doesn't have the flash sync port as the C3. However, many C2s were later retrofitted with the flash sync port by the manufacturer. The difference is obvious when looking inside the body -- a groove is drilled in the bakelite body to fit the cable.